Before Susan G. Komen died of breast cancer in 1980, she asked her sister Nancy to promise to work towards finding a cure. Now, more than 30 years later, the organization that bears Suzy's name is still fighting — but instead of fighting for a cure, it seems to be fighting for an agenda. Who was Susan Komen, and what would she think of the foundation's downward spiral? Would she even want her name on it anymore? Susan G. Komen was diagnosed with cancer at age 33, and succumbed to the illness three years later, at age 36. 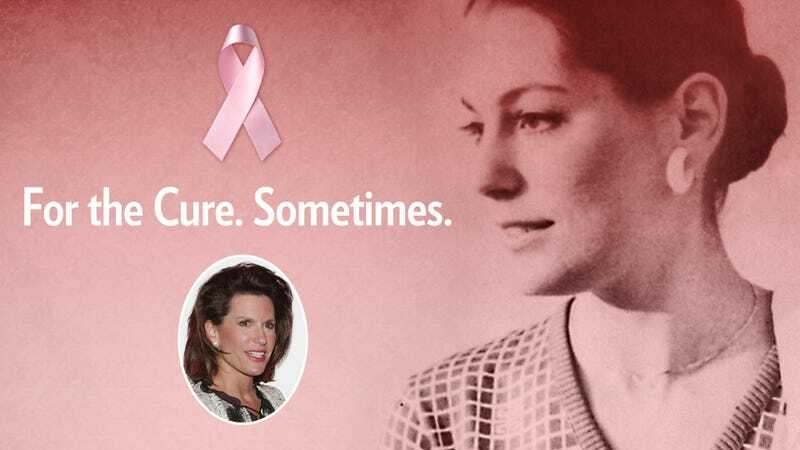 Susan G. Komen For the Cure was established shortly thereafter in 1982 by her older sister, Nancy Brinker. Since the foundation's inception, over $1.9 billion has been raised for breast cancer research and prevention. All well and good, right? But in recent years, it seems that the organization has lost its way, becoming more about self-promotion and self-preservation than honoring Nancy's promise to Suzy. For example, the organization has refused to acknowledge the link between the chemical BPA and cancer even in the face of piles of science establishing a link, presumably because several of their large donors just so happen to manufacture products that rely on BPA. In 2010, they spent more than $1 million suing smaller charities that used the phrase "for the Cure" in their names or in their events. The organization said that this was to prevent donor confusion. One fundraising program encouraged socially mobile cancer fighters to battle cancer themselves by mailing in Yoplait tops in order to prompt the company to make a 10-cent donation. Postage at the time was 37 cents; Yoplait prices varied. Finally, Komen claims to be apolitical, but CEO Nancy Brinker identifies as Republican, donates large amounts of money to Republican political candidates, and served as ambassador to Hungary during the George W. Bush administration. The addition of pro-life Georgia politician Karen Handel to the executive suite wasn't an aberration, but rather a continuation of the gradual reddening of the foundation. It's hardly surprising that they exhibited so little courage in the face of right wing confrontation; the organization has grown from a sweet promise to a dying sister into a pink clad right-wing sorority of sanctimonious hypocrisy. By cutting funding to Planned Parenthood, Susan G. Komen for the Cure has broken its promise. It's shown it values its anti-abortion agenda more than it values its anti-cancer purpose. Anti-abortion group have spent the last day or so victory dancing over Komen's decision, some surmising that the loss of the Komen contributions would finally cripple Planned Parenthood and its "abortion machine" once and for all. They're crowing about denying poor women access to such babykilling services as the funding and referral assistance that allowed Planned Parenthood of Southern New England to provide over 950 mammograms referrals and 69 ultrasounds to women. Komen funds paid the salary of a part-time employee at Planned Parenthood in New Jersey who provided cancer prevention education. In Washington and Idaho, grants from Komen to Planned Parenthood funded screening services for women who otherwise would not have access to them. In Nassau County, New York, more than 10,000 women were provided breast cancer screenings, education, and referral due to Komen funds. This — services designed to prevent and fight breast cancer — is what was promised to Susan G. Komen. Not politicking, defensive marketing, and denial of science to appease donors. Ironically, Susan G. Komen for the Cure's withdrawal of support for Planned Parenthood may end up doing more damage to the charity's image than imaginable, and more for women's health than a million pink ribbons could. Reaction to the move was overwhelmingly negative— one analysis of web reaction to Komen's withdrawal of funding found that only 25% of people who wrote about the move wrote positively about Komen. And according to Elizabeth Clark, Senior Media Specialist for the Planned Parenthood Federation of America, in the last 24 hours, more than 6,000 individual donors have contributed over $400,000 to Planned Parenthood, with donations still rolling in. For some perspective, last year Komen gave Planned Parenthood a $580,000 grant. Of course, none of this makes Komen's withdrawal of support — or their lies about why they did so — any less despicable. Would the real Susan G. Komen be satisfied that the legacy of her sister's promise? Would she want access to breast cancer treatment to be dependent on a woman's income? Or would she hope that "curing cancer" meant espousing an ideology that sought to heal and help rather than divide and deny? That sounds a lot more "pro-life" to me.